With 10 staffers working the federal and state beatsand three more to be hired this yearthe FSI is flexing its advocacy muscles. 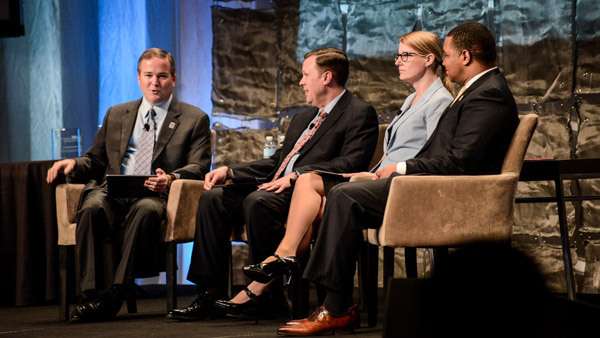 FSI CEO Dale Brown (far left) with David Bellaire, FSI general counsel; Robin Traxler, VP of Regulatory Affairs, and Robert Lewis, VP of Legislative Affairs, at the 2015 FSI OneVoice Conference. Last year the Financial Services Institute celebrated its 10th anniversary as the independent broker-dealer industry’s advocacy voice in Washington. But FSI is not resting on its lobbying laurels, with plans under its $8.5 million 2015 budget to increase its total advocacy head count from 10 to 13 (FSI currently has a total professional staff of 27). Two of the current 10 advocacy staffers — Robin Traxler, VP of Regulatory Affairs and Robert Lewis, vice president of Legislative Affairs — spend the majority of their time on state regulation and legislation issues. In an FSI leadership press conference and a general session during last week’s FSI OneVoice conference, and in separate discussions with FSI staff during that San Antonio meeting, FSI flaunted its growing influence in Washington and the states, though David Bellaire, FSI executive VP and general counsel, said in the general session that “our secret weapon” in advocacy is “our 35,000 members who can get the attention” of their congressional representatives. The headline advocacy issue at the late January conference was a leaked January White House memo that seemed to call for a strict fiduciary standard on retirement plans under the Department of Labor (which some sources expect to be released the week of Feb. 9-13). Amy Webber, president of Cambridge Investment Research and FSI’s vice chairwoman for 2015, said at the press conference that “our industry is under attack,” particularly on the fiduciary issues at the DOL and the Securities and Exchange Commission, and that FSI’s advocates “tell legislators that our goals are the same as yours — to protect investors.” But she urged policymakers to “not take outdated approaches,” as was evident in the White House memo, in attempting to protect investors. 1) Preserving and expanding consumer access to advice — which is why FSI is so concerned about the Department of Labor’s redefinition of fiduciary under the Employee Retirement Income Security Act. 3) Work with the Financial Industry Regulatory Authority to streamline regulations — he said FSI was pleased with FINRA’s recent cash compensation rules. 4) To make regulation work for the investing public — he cited the issues of financial literacy and the financial abuse of elderly Americans. 5) To build relationship with regulators, legislators and community groups. If the comments of Antoniades and Webber on the White House memo reflected FSI’s ire, CEO Dale Brown’s comments during OneVoice reflected a quieter, more businesslike approach to making FSI’s voice heard in Washington. “We’re interested in constructive engagement” with policymakers of all kinds, Brown said repeatedly. His message suggested clearly as well that such engagement isn’t limited to one political party or regulator, or self-regulator. A look at the Federal Election Commission data on FSI’s political action committee’s donations to lawmakers supports Brown’s contention. According to OpenSecrets.org, part of the Center for Responsive Politics, which analyzes the FEC data, in the 2014 election cycle ending Dec. 31, the FSI PAC raised $335,166 and spent $281,000. Of that spend, 48% went to Democrats and 52% went to Republicans. The donations were also widely distributed — to 11 senators and 54 House members — while the highest contributions — of $10,000 each — went to five House members (three Republicans and two Democrats) and two senators, both Democrats. The donors to the FSI PAC in the cycle ended Dec. 31 qualified as broad and grass-roots-led; the largest individual donors were 27 people who gave $5,000 each to the PAC, including Brown, Antoniades, Webber, Robert Moore of LPL, Richard Lampen of Ladenburg Thalman and David Stringer of Prospera. The list of donors is sprinkled with the names of home office executives from most independent broker-dealers along with a number of individual financial advisors. Bellaire said that while FSI doesn’t have “day-to-day contact” with the White House, the group has had several meetings with White House staffers over the past four years. On Jan. 23, the Friday before OneVoice was held in San Antonio, FSI and several other financial services organizations met with Valerie Jarrett, senior advisor to President Barack Obama, on the DOL retirement issue. — Check out FSI Chair Blasts White House Fiduciary Memo as ‘Offensive’ on ThinkAdvisor.